The Summer School „Life Sciences in the 21st Century with a Focus on Water“ is a joint project developed by Technische Universität München (TUM) and University of California Davis (UCD). The course is intended for PhD candidates and interested students from both universities. The main goal of the Summer School is to present selected topics of specialization at both universities with an interdisciplinary focus on “water”. Due to limited water resources and the increasing demand for water in times of population growth, researchers in California are working intensively to find solutions for a sustainable water management. This requires the integration of approaches from engineering and technical sciences as well as from aquatic systems biology and ecology. At TU München, scientists from the fields of biology, chemistry, geosciences and engineering are also developing sustainable approaches to water resource management, ranging from breeding efforts in low water-use crops, to the restoration of aquatic habitats. The mutual exchange of ideas and strategies to solve water-related problems will thus be strategically valuable for both partners. Both universities run aquatic research stations. The Summer School Life Sciences in the 21st Century with a Focus on Water seeks to establish the most important parallels and divergencies in the research approaches of both institutions. It combines lectures and workshops held by keynote speakers from both universities as well as excursions to related research facilities at TUM. The participants will visit TUM’s limnological station in Iffeldorf. A site visit to the Institute of Water and Environment in Obernach is also planned. The course includes an intercultural component to promote the communication and mutual understanding between Bavarian and Californian participants. An intercultural training seminar given by a professional facilitator specialized in American and German cooperation will foster cultural awareness among the participants. The Summer School includes a social and cultural program. On the weekends tutors will accompany participants to sights in and around Munich. (e.g. Neuschwanstein, Partnachklamm, …). 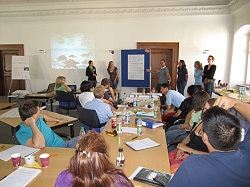 For the first time in 2011 the Technische Universität München (TUM) ran the BaCaTeC Summer School „Life Sciences in the 21st century with a Focus on Water“chaired by Prof. Jürgen Geist. The summer school took place at TUM’s Centre of Life and Food Sciences Weihenstephan in Freising and was bilaterally organized and realized in cooperation with Prof. Peter Moyle and Dr. Richard Connon from the University of California Davis. A total of 24 graduate and PhD students from Technische Universität München and from University of California successfully passed the selection process and participated in the two-week summer school. International keynote speakers from both universities (five from UCD, 7 from TUM) held workshops with a focus on “water” and “life sciences”. Their presentations stimulated further discussions among the participants. Water is of key importance to human societies. Solutions to water-related problems differ among countries and often require approaches which integrate ecological, societal and technical skills. The main goal of the summer school was thus to provide a forum for the interdisciplinary exchange of ideas among the participants and keynote speakers, who came from various research fields in the biological and engineering sciences. 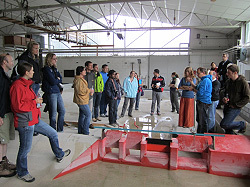 As part of the program participants visited related research facilities such as TUM’s Limnological Station in Iffeldorf, the Insitute of Water and Environment in Obernach and the Bavarian Academy of Sciences and Humanities. They tested various European and North-American methods used to examine running water at the experimental plant of the chair of Aquatic Systems Biology. 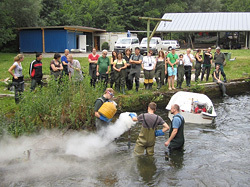 With the collected data of the water quality and the aquatic habitat in the river Moosach near Freising, they were able to create an ecological model assessment of the ecosystem. 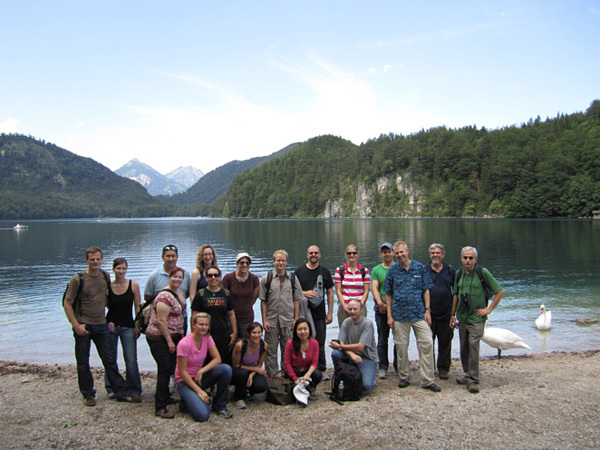 During the visit of the Limnological Station in Iffeldorf, Professor Arnulf Melzer and Dr. Uta Raeder introduced the characteristics of the ecology of the lakes situated at the foothills of the Alps. At the Institute of Water and Environment, Professor Rutschmann introduced new concepts of hydropower use. Finally, the participants were also able to discuss the socio-economic dimensions of the topic “water”. During an excursion to the River Isar, Dr. Arzet presented Munich’s ongoing restoration plan for the river. During the summer school there was time for networking and personal discussions within a rich and varied cultural program. The participants discovered the history of the city Freising and the brewery Weihenstephan and visited the famous castle Neuschwanstein. One of the highlights of the cultural programs was a concert of classic music. The musicians had even chosen pieces which included the motif “water.” An intercultural all-day training promoted the communication and mutual understanding between German and American participants and gave new aspects for the successful cooperation between the scientists. The joint summer school is an important milestone in the history of the strategic partnership between Technische Universität München and University of California Davis. Further summer school projects will take place in 2012 in California.